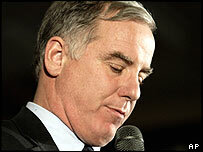 Former Vermont governor Howard Dean has announced that he is dropping out of the race to be the Democrats' candidate for the White House. Mr Dean told a news conference that his candidacy was over but his campaign for change continued. "What we showed is that by standing up and telling the truth... you could get the support of voters," he said. Mr Dean's decision to pull out looked inevitable after he finished a distant third in Tuesday's Wisconsin primary. Surrounded by a crowd of supporters, Mr Dean told the news conference in Burlington, Vermont, " I am no longer actively pursuing the presidency." But he would continue to build a new organisation, he said, using their grass-roots network to "transform the Democratic Party and change our country." In keeping with his use of the internet, Mr Dean's web site carried news of his withdrawal before he appeared in public to announce it. "Please continue to come... for updates and news as our new initiative develops. There is much work still to be done, and today is not an end - it is just the beginning," the message said. Mr Dean, who finished third in Wisconsin behind front-runner John Kerry and John Edwards, did not endorse another candidate but said he would support the party's nominee. "The bottom line is that we must beat George W Bush in November, whatever it takes," he said. Mr Kerry, 60, who won 14 of 16 previous contests to find a challenger to George W Bush, took 40% of votes after a late surge by Mr Edwards who got 34% support. Mr Dean was once favourite to be picked by Democrats to stand against President Bush in this year's election. He built up what seemed formidable grass roots support, using the internet to attract support and raising millions for his campaign. But his challenge stumbled from the start when he finished third in the Iowa caucus and second in the New Hampshire primary, both of which he had been expected to win. It seems despite the initial euphoria, those same grass roots supporters who may have liked what Mr Dean had to say on Iraq and opposing tax cuts for the rich, were also aware of his deficiencies, says the BBC's David Bamford. He may once have been the likeliest to win the nomination but was also seen as unlikely to defeat President Bush, our correspondent says. Most delegates who vote for a candidate at the national presidential nominating convention are allocated according to a candidate's support in state-wide caucuses or polls; some delegates are assigned for party leaders and elected officials to allocate. "He often came across as too agressive"